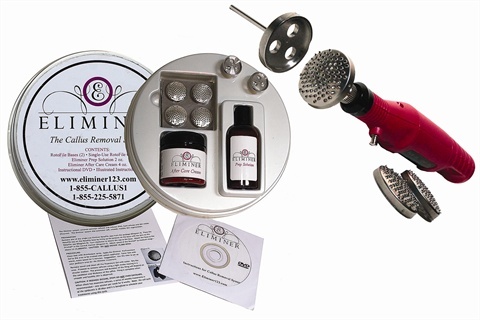 The new Eliminer Callus Removal System is a safe and effortless power-driven filing system that quickly smoothes out calluses. The Eliminer RotoFile consists of the RotoFile base, which fits most electric files, and the disposable RotoFile cap, which just twists on. No sterilization is required since the disposable cap is thrown away after use on each client. The system also includes Prep Solution, which promotes light exfoliation and prepares the area for the Eliminer procedure, and After Care Cream, a hydrating solution that promotes rapid healing of treated areas. The After Care Cream can also be retailed to clients to maintain smooth and healthy skin. 1. Clean the client’s feet and apply Eliminer Prep Solution to the callused area. 2. Wrap the feet in warm, moist towels for three minutes. 3. Take the disposable file head and attach it to the bit base. Line up the grooves on the side of the head and turn it clockwise. Set the drill speed to medium or high. The adjustment should be determined by the thickness of callus. Remove the towels. 4. Start filing, working in a rotating motion as you remove the dead skin cells. Light to medium pressure is required for comfortable exfoliation. Move about the foot adjusting the RotoFile to the different angles. Desired results should be determined by the smooth look of the skin. Do not over exfoliate and stop immediately if redness occurs. 5. Proceed with pedicure as you normally would, and dispose of the RotoFile head. 6. After the pedicure, apply After Care Cream. This also makes an excellent retail product for clients to maintain smooth and healthy skin. Watch a video of the Eliminer Callus Removal System: www.nailsmag.com/video/Eliminer. For more information, go to http://www.eliminer123.com/.